We are a small company that wants to show you the ropes of the interior of Alaska with guided stand-up paddleboard trips. Grab a board, start paddling and enjoy the scenery with trips available all summer. 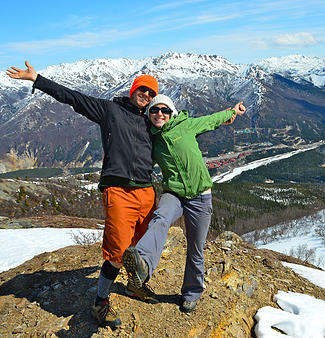 If you are in the Fairbanks area looking for something fun to do, we’ve got it! Starting at The Pump House Restaurant, right off of Chena Pump Rd., we will head down river to meet the mighty Tanana. As the rivers flow just South of Fairbanks, their calm waters and beautiful scenery just outside of town offer a perfect adventure on paddle-boards! There will be time for 1-2 breaks and areas to swim as well. Meet us out at our private pond, just south of Fairbanks and paddle on the spacious lake and warm water. Nice beaches, plenty of parking and no boats offer the perfect morning or afternoon to take the boards out. This is the best deal you can get and the closest to Fairbanks City Center. We will put in on the Chena River right in the heart of downtown Fairbanks at Graehl Park and take out at the famous “Boatel” where you can enjoy a beverage on their sunny deck over-looking the Chena River! After several seasons raft guiding and rock climbing in California, Montana, Alaska and other parts of the world, we decided to share our knowledge and love of rivers with other fellow adventure-seekers. 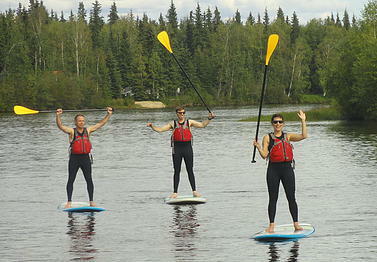 We are prepared to show you a fun and safe paddle-board trip and ready to enjoy the summer with you in Fairbanks. Join us on a guided stand-up paddle board trip down mighty Alaska rivers in the far North and see what the interior of Alaska is all about! Lifejackets, wetsuits, paddles, boards, guide(s) and transportation back to the launch site. *If you are lodging within Fairbanks city limits we will be happy to pick you up before your trip and drop you off afterwards. Waterproof camera with a leash or something to attach it to your lifejacket. No cotton! Cotton gets wet, it stays wet, and you get cold. Bring wool or fleece instead. There are many options for food around town after you’ve burned some of those vacation calories. Visit www.explorefairbanks.com/guide to see what the town has to offer for restaurant options. No way, there is something for everyone. If you want to start small, come out to the Private Pond and get comfortable on flat water. The boards are easier to balance on than you think and paddling is a fun, easy workout. If you want to go for something a little more exciting, head to a river run and see what standing on moving water feels like. Need some help finding housing, check our partner below. Please do not hesitate to give us a call or write us an e-mail and we will be happy to answer any more questions you may have.